Big Hero 6 is wonderful. It represents the best of what Disney and Marvel can do when they combine their brands and work together on a project. It’s relentlessly colorful, engaging, and fun, while also having an emotional core that never negates the tone, but enhances it. It’s a movie about superheroes and coming of age and dealing with your emotions, and while the story might not be perfect, it’s perfectly suited to this movie. 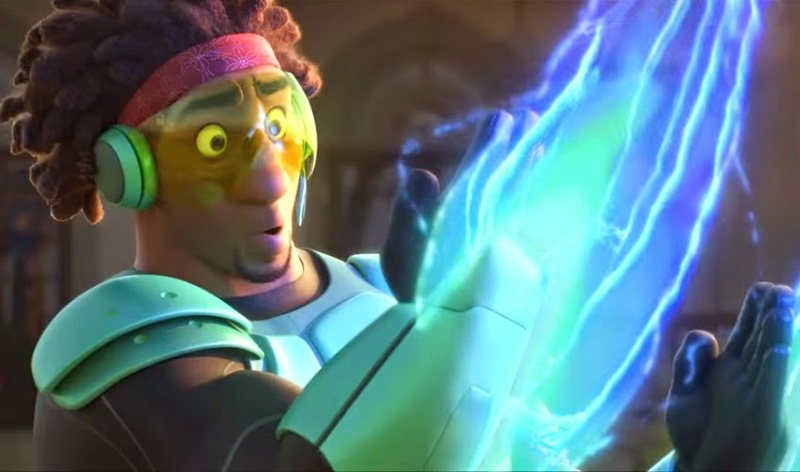 The animation is gorgeous and stylistically different enough from some of Disney’s recent work that it’s rather refreshing, though not as different as I might have liked. The characters are incredibly compelling and well designed, with unique personalities and roles in the plot, and that adorable, huggable robot on all the movie posters really is adorable and huggable in the movie. He even manages to avoid being cloying, a rare talent. 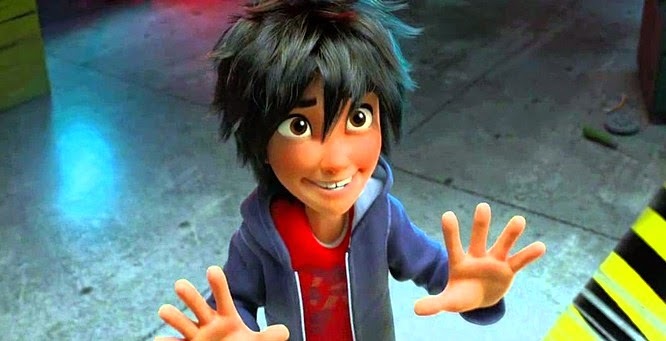 This is not to say that there are no problems with Big Hero 6, but rather that the problems that manage to sneak through into the film are the sort of systemic, frustrating, intractable ones that we might not have even noticed if the rest of it weren’t so good. For example, while the film displays admirable levels of diversity (the majority of the cast is non-white, and voiced by non-white actors), the female characters are still uniformly thin and conventionally attractive. They might differ slightly in body type and build, with one character being tall and thin, the other short and wiry, and another average height, but they are all thin, and they are all designed with the same basic facial features and tiny up-turned nose. This grates, of course, because the male character designs are actually a big relief in their diversity. Their body-types, builds, and facial features are radically different even within families. It’s frustrating to know that such body diversity was possible in the female cast, but that the animators for whatever reason decided not to pursue it. That’s always annoying. But, like I said above, this is the sort of complaint that really only comes when the majority of the rest of the film is above reproach. And here it is. 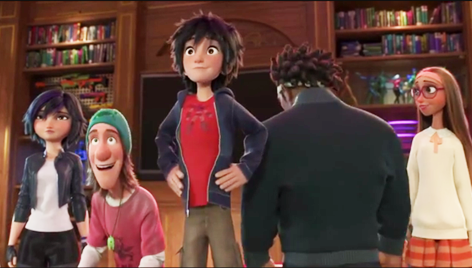 The story, which I will endeavor not to spoil much, starts with the introduction of two brothers: Hiro (voiced by Ryan Potter) and Tadashi (Daniel Henney). Both of them are geniuses, with a specialty in robotics. They live with their Aunt Cass (Maya Rudolph), a lovable nut who does her best to care for the boys, but openly admits that she's got no real business being a parent. The two boys, much as they adore each other, are very different in temperament. Hiro, the younger, is brash and full of himself, preferring to enter his robots in illegal street bot fights to earn a quick buck rather than actually use his skills for something worthwhile. Tadashi, on the other hand, is full of responsibility and the belief that he should help people. He goes to a local college that specializes in science and technology, and there he's amassed a number of quirky, lovable, brilliant friends. There's GoGo Tamago (Jamie Chung) who works with electromagnets to make a frictionless bike wheel, because nothing could possibly be fast enough for her. There's Wasabi (Damon Wayans Jr.) who's using a laser grid to cut things into impossibly thin slices just to see if he can. Honey Lemon (Genesis Rodriguez) is a mad scientist with chemistry, who loves turning things pink and then disintegrating them, mostly for the hell of it, but also because she can see some useful applications. And then there's Fred (TJ Miller), the school mascot and resident "science enthusiast". He's the token white guy, and he's lovable and sweet, ridiculously pumped about all the awesome science everyone else can come up with. Finally, though, we get to see Tadashi's project, and it's a doozy: He's programmed a functioning robot with AI to serve as a healthcare provider. 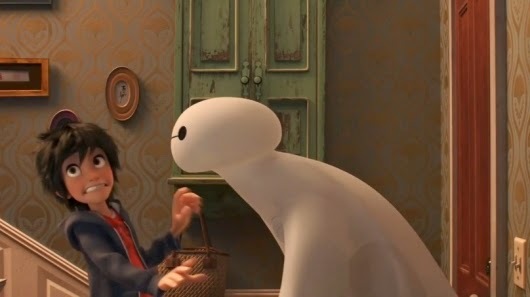 Baymax (Scott Adsit) activates when he hears a "call of distress" - someone saying "Ow!" - and will treat any and all medical and psychological problems to the best of his ability. His design is "huggable and nonthreatening", and he's created to be useful, portable, and easy to manufacture. In other words, Tadashi's trying to solve the healthcare crisis, one patient at a time. But then tragedy strikes. Inspired by his brother and all of the awesome inventions his friends are working on at the lab, Hiro creates his own robotic wonder: Microbots. Microbots are little functional pieces that can be controlled with a neural network, and can be used to build skyscrapers or tear down buildings. He uses the Microbots as his entrance application to the university, but something terrible happens at the science showcase. Hiro's Microbots are thought destroyed, and the whole group reels from the deaths of some people they love. Without giving too much away, eventually we discover that Hiro's Microbots were not destroyed, but stolen, and are now being used for nefarious purposes by some evil supervillain-type guy whose plans are unclear but probably really really bad. The only solution? Suit Baymax up into a set of robotic armor, make everyone else a superhero costume too, and fight crime! If this sounds a little silly, that's okay, because it is. It is a little silly, and the movie never tries to distance itself from the inherent ridiculousness of its premise. But it also doesn't let the silliness of a group of science nerds putting on special suits and fighting supervillains overwhelm the real emotions at the core of the plot. The story here is really about grief and pain, and how we have to deal with these emotions, as painful as they are. The film even goes so far as to show what happens when you let yourself be consumed by anger and don't give yourself time to heal. Anger can make you seek revenge, step over other people, even hurt the people you love most. It's not pretty. Instead, the movie makes it clear that real emotional healing is slow and hard and worth it. You can't shut people out. You can't try to fight the pain. You just have to keep going, while remembering what you've lost. Big Hero 6 gets away with such a sad and emotionally draining story precisely because it's so fun and happy. It balances. We get that this world is heightened and candy-colored and full of impossible things. That's what makes it easier for us to process Hiro's pain. The setting and tone don't detract from the message of the movie, but they do make the message easier to handle. It will get better. It will take time. Part of what makes me like this movie so much, actually, is that it decided to go there. This movie does not step away from hard things, and it does not pull punches with your emotions. You are placed very fully into Hiro's world, and shown his choices, and shown that he does not always choose the most healthy option. He does bad things. He says mean things. It's hard to watch, but oh so good. And to have the voice of reason in the film turn out to be a healthcare robot is really compelling. 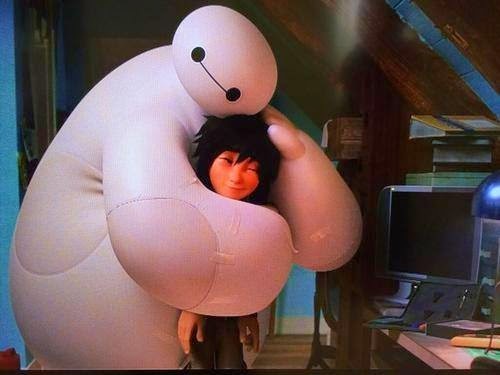 Baymax, for all that he's a brilliantly designed AI, is not human. All he knows about people is what was programmed into him or what he learned off the internet. Baymax isn't human, nor does he have any desire to be human, and that endows him with the ability to describe and treat grief without feeling it himself. It's very effective, and makes him one of the most sympathetic characters, as everything he does is inherently selfless. But the real point of the movie is, like I said, about grief, and how we can't just shut ourselves away or lash out in anger when something bad happens. We really do need to rely on each other. Because community, family, and friendship are some of the most important parts of our lives. Without those relationships, without love, all of our smarts aren't worth a whole lot. You know what? I can get behind a movie with that at its center. It's message that we seem to be squeamish telling to children sometimes, because in order to talk about grief we have to address the unpleasant fact that bad things happen sometimes. To address grief we have to address the things that cause grief, and admit to children that sometimes we can't do anything to stop bad things from happening. It's hard to admit that, especially to a child who thinks you can do anything. It's hard to talk to kids about stuff like this, but it is so important. If children don't learn how to deal with grief, that bad things happen, and how to lean on the people around them when these things do, then they will grow up stunted and afraid. That's a bad thing. Instead, let's use movies like Big Hero 6 to help kids learn how to process their feelings. Let's admit that sometimes bad stuff happens and we don't know why, but also teach them how to lean on each other to make it through. Let's teach them that they can always be a hero, and that heroes are the ones to sacrifice to help others. These are good messages, even if they are hard conversations. One last thing before I let you go. I mentioned up top but this bears repeating, it is so nice to watch a movie where all the main characters, all the heroes, are science nerds. They're absolute geniuses who love and adore science. The only two characters who aren't science wizards, Aunt Cass and Fred, are science groupies and have endless enthusiasm for learning and education. Heck, the message of the first part of the movie very clearly shows that education is a good thing. Hiro is wasting his life and his gift, but if he got an education he might be able to actually harness his intelligence and use it to help people. The fact that helping people and using your education for good is seen as the ultimate end goal of a purposeful life is just so refreshing. Yay for education and helping people! Overall, I loved this movie, I really did. It was emotionally honest and moving without ever losing its sense of joy, and it was different from anything else I've seen recently. It's both fully a Marvel movie (complete with Stan Lee cameo) and fully a Disney movie, and it seems that this one property has brought out the best in both companies. Can't really find fault with that.